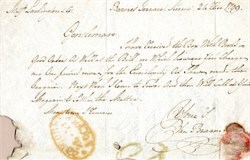 Letter from 1799 - Barnes Terrace signd by ? van Braam. Barnes is a district in south-west London, England, within the London Borough of Richmond upon Thames. It is located around 5.8 miles (9.3 km) west south-west of Charing Cross in a loop of the River Thames, with Hammersmith Bridge at the north end. Barnes has a number of 18th- and 19th-century buildings of exceptional quality, and is often noted for its historic village area centred on the pond, forming the Barnes Village conservation area. Some of the oldest riverside housing in London is to be found on The Terrace, a road lined with Georgian mansions which runs along the west bend of the river. Construction of these mansions began as early as 1720.